to start a festive meal with a light touch. Assembly of the year and grape variety. The amount of assembled wine is twice the volume bottled, the remaining part is kept in tanks as a base to assemble the next. Thus in time, you will find the "homemade taste" perfectly reproduced that characterizes this wine. Deposed by the seas of the end of the Mesozoic era, there was a few hundred million years the chalk of Cretaceous can go down to 200 meters deep. It absorbs heat and return it. She did the same with water to regulate the absorption by vines that plunges its roots up to 3-4 meters deep. Picked by hand, with selective screening on the bunch. liveliness.Stock in vats and cellars: approximately 5 years. to preserve the “sweetness/freshness” complex. 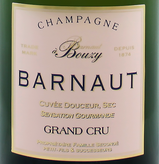 golden colour.- Bouquet : small red fruits, notes of honey and wax.